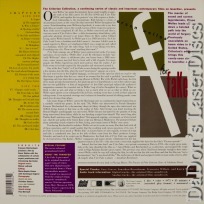 F for Fake 1976 - 85 min. 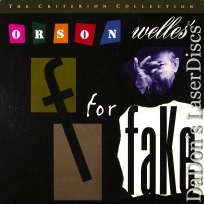 - Color Genre: Documentary Not Rated Country: USA LaserDisc Movie Storyline: Orson Welles has a ball examining the nature of what is real and what is fake in the funny, bizarre F FOR FAKE. Four people stand at the center of this documentary: Elmyr de Hory, who some believe forged more than a thousand masterpieces, many of which hang in some of the world's most famous museums; Clifford Irving, who is not only out to prove what a fake Elmyr is but also wrote a fake biography of Howard Hughes; Oja Kodar, who claims that Pablo Picasso painted 22 canvases of her that no one has ever seen; and Welles himself, who harks back to his days creating the havoc-causing THE WAR OF THE WORLDS for radio. But the true star of the film is the editing; from absurd stock footage to shots of Welles smirking into the camera from different locations to scenes with a monkey scurrying about, the film is vastly entertaining to watch. F FOR FAKE is an underrated, underappreciated work of comic genius about the nature of reality, celebrity, and art, by a master filmmaker showing a surprisingly wicked sense of humor.